I will be spreading the blueberry gospel with a BLUEBERRY GROWING WORKSHOP at my farmden on July 30th, from 9:30 to 11:30 am. This workshop will cover everything you need to know to be on your way to picking your own blueberries, including soil preparation, obtaining plants, watering, fertilizing, pruning, and, or course, eating (and tasting). The cost is $40. Space is limited so reservations are a must. Contact me through my website “contact” (at right) for more information. One small, red flower caused quite a bit of excitement last week. It was a pomegranate blossom, which is quite flamboyant in and of itself, but the real excitement was because I’d been waiting for this one for 6 years. 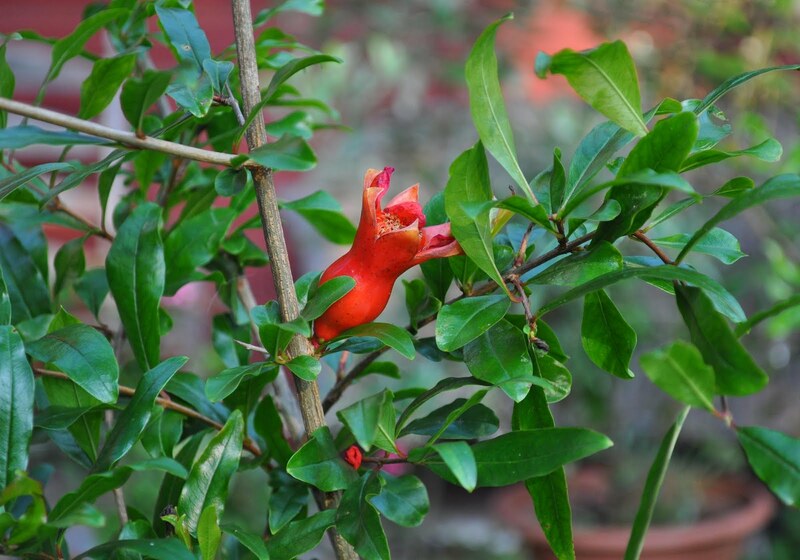 Pomegranate would normally freeze, dead, in our cold winters. It’s a Mediterranean plant that calls Western Asia home, just like figs. And, like figs, it can be grown in pots that can be carried to a cool place (a barely heated garage, an unheated room, or my cool basement) in winter, and then put outside during the growing season to bask in sunlight and warmth. One big difference with figs is that many fig varieties bear fruit on new shoots each season. So figs bear well even if old stems are cut back by pruning shears or winter cold, as long as the growing season is sufficiently long. Pomegranates stems need to be 2 to 3 years old before they’ll bear fruit. So every spring and early summer for the past few years I’ve been anxiously eyeing the stems, looking and hoping for signs of blossoms. Finally, a couple of weeks ago, I saw a red swelling and finally, last week, that swelling unfolded into a beautiful, fire engine red blossom. Such beauty! Pomegranates are sometimes grown as ornamentals for their blossoms alone. Not here, though. I want fruit. I dabbed an artist’s brush into the blossom just to make sure it got pollinated, and it soon started swelling into the beginnings of a fruit. Or, so I thought. Today, I touched the fruitlet, and it dropped to the ground. No matter, because a few other blossoms have also begun to form and open on that and my three other pomegranate plants. Last week’s bout of rainy weather – very un-Mediterranean-like – could have been responsible for the poor fruit set. I have high hopes with this week’s dry, sunny weather. Another delectable fruit of Mediterranean climates, pineapple guava, has been in bloom for the past couple of weeks. This plant is native to South America but I’ve seen it planted and thriving as an edible, ornamental shrub in California and Italy. The leaves, silvery green on their upper sides and almost white on their undersides, look right at home under intense Mediterranean sunlight, and also look pretty good on the plants at the end of my driveway. Like my pomegranates, my pineapple guavas are in pots so they can be carried down to the basement for winter. In years past, I’ve harvested a few of the torpedo-shaped, velvety green fruits; they are delicious, with a minty pineapple flavor and smooth, soft-gritty texture. The flowers are as much a culinary treat as are the fruits. The fleshy petals are intensely sweet with a refreshing hint of mint. I’m careful to pinch off the petals without damaging the rest of the flower so that the flower can then go on to become a fruit. I also brush my fingers from the bottlebrush of carmine stamens to the central stigma to effect pollination since the petal-stripped flowers will no longer be attractive to insect pollinators (although I’ve never seen any insects playing on the flowers anyway). Once fruits begin to swell on the pomegranate and guava plants, the race begins for the fruits to ripen before the growing season ends. Both fruits require a long season from the time they first set until they mature. I may have to bring them indoors to finish ripening. Even better would be to move them into the greenhouse so that warmth and bright sunlight there can bring out the best flavor in these fruits. Sunlight should be adequate in the greenhouse because the latitude here in the Hudson Valley is about the same as that of Tuscany, Italy. Hanging on the brick wall near my Mediterranean fruits is a Mediterranean flower, or one that also thrives in climates with hot, dry summers. The flower, moss rose (Portulaca grandiflora), is, in fact, native to Argentina. It’s powdery seeds germinate quickly and easily and the plants are as care-free as any plant can be as long as given sun and well-drained soil. 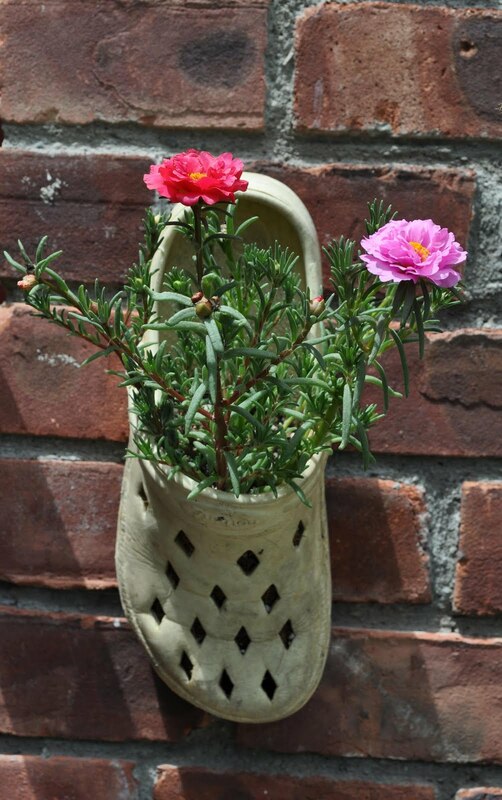 An old pair of Crocs garden shoes that I no longer wear seemed like they would be a perfect home for a few of the moss rose seedlings I grew in spring. So I lined the inside of the hole-y footwear with coir (coconut fibre) and filled it with potting soil. I also embedded a small loop of wire near the heel so the Crocs could be hung. Soil drainage: Taken care of. The brick wall near my front door bathes in unobstructed sunlight from early morning until about 2 pm, and that’s where the portulaca-ed Crocs now hang. For the occasional watering the plants require, I get day after day of the cheeriest, colorful blossoms you can imagine. 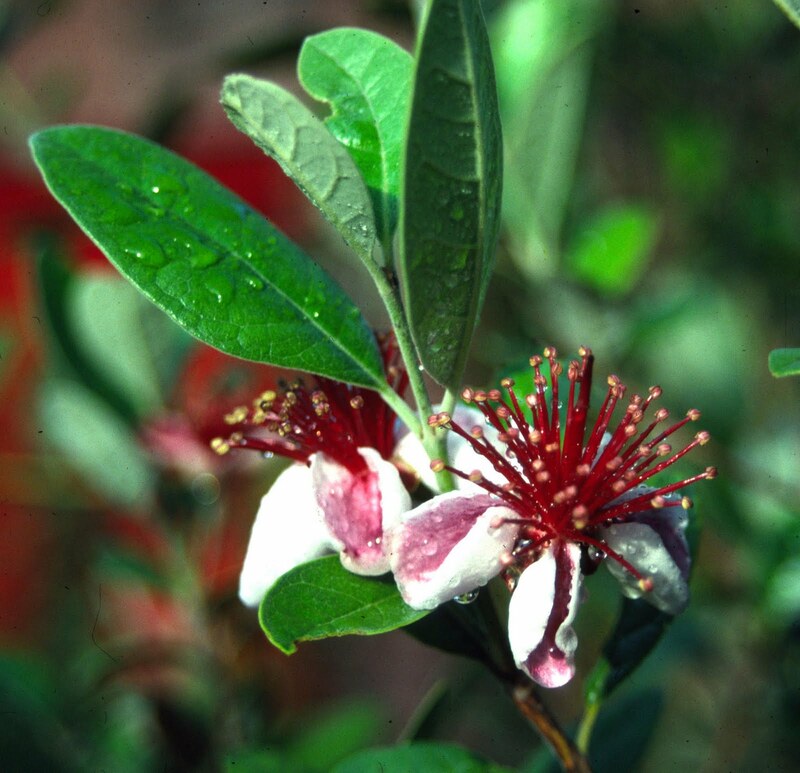 I thought that pineapple guava was an evergreen that requires full sun during the winter. Am I mistaken about this? If it can go dormant like figs, that would certainly make it an easier plant to grow up north. Thank you for the great blog! Correct, it is evergreen. I keep my pineapple guava in a cool place in bright light. I replaced my Bilco cellar door with clear polycarbonate plastic on a frame. The guava sits down there in my very cool basement for the winter, dormant but evergreen. Sometime I’ll write about and post a picture of the setup.